Seems interested in your food! Gerber has a good, short online quiz that you can take. It basically asks you the above questions and lets you know whether your baby is a good age to start trying solid foods. Also check out our quick guide on how to start solid foods. If you're ever uncertain, always consult your pediatrician before starting, and make sure you have one of the best high chairs for posture and support! Baby Cereals are usually the first recommended solid food for babies 4 to 6 months of age. This is for a few reasons. First, it gets your baby used to a unique food texture in the mouth without any new strong flavors and gets them used to coordinating and swallowing something thicker than milk. Second, around 6 months of age your baby's iron needs usually exceed what is available in breast milk or infant formulas, so iron-fortified baby cereal is a great way to supplement. Third, cereal is unique because you mix it with breast milk or baby formula to make it a more familiar flavor for your baby and reduce the likelihood that your baby outright rejects it - this is especially important if you're dealing with a picky eater. Be sure to also check out our reviews of the best organic baby formulas. Best Baby Cereals (4-6 months) of 2019: We purchased and tested 14 baby cereals with 3 different infants. We checked the cereal's consistency, ease of feeding, and taste. With the babies, we tested how they seemed to like it and how it affected their bowel movements. Remember that too much iron can make things a little "slow going" down there. Here are the Best Baby Cereals of 2019! 1. Gerber Organic Baby Cereal. This comes in Oatmeal, Brown Rice, and Oatmeal with Peach and Apple flavors. You'll want to start with the Oatmeal and Brown Rice, and then move on to the Oatmeal with Peach and Apple flavor. We found the oatmeal to be the perfect consistency for a first food. It also wasn't quite as sweet tasting as the brown rice (the oatmeal with peach and apple was the sweetest tasting of the three). We mixed it with breast milk and the babies seemed to like it quite a bit! All varieties have just about the same nutritional composition, with 45% daily Iron content per serving, 2 grams of sugar, and about .5 to 1 gram of fat. The iron content is a good supplement for a growing baby, and not so much that it will induce constipation. Note that the Oatmeal versions are not gluten-free, but the brown rice version is. Contains pretty simple ingredients: oatmeal or brown rice, two organic sources of choline to support brain and eye development (soy lecithin and choline bitartrate), and vitamins and minerals. Overall, a great first oatmeal without any additives with questionable sourcing or manufacturing practices. Interested? 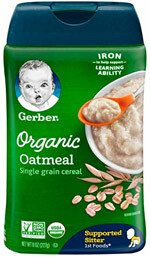 Check out the Gerber Organic Baby Cereal here. 2. Earth's Best Organic Baby Cereal. Like the Gerber options, this comes in several varieties including Oatmeal, Brown Rice (what they call "whole grain rice"), Oatmeal with Banana, and Whole Grain. The Oatmeal variety says it may contain traces of wheat/gluten, but the Brown Rice version is gluten-free. The great thing about Earth's Best is that they genuinely take a lot of pride in the foods they produce. They're a smaller company (owned by the Hain Celestial Group) that takes genetically modified ingredients very seriously (check out their mission at Earth's Best). We're not saying that Gerber doesn't take these things seriously, but Earth's Best simply has a better track record (in our opinion). So back to the food... Other than the oatmeal and bananas variety, these options were a bit blander to the taste than the Gerber (maybe because they contain 0 grams of sugar), but the babies definitely didn't seem to mind that at all once it was mixed with breast milk! Like the Gerber, each serving contains 45% of daily Iron content, and about 1 gram of fat. You may have thought the Gerber ingredients were simple, but these are even simpler! Two things: the main ingredient (whole grain oats or rice) and the vitamins/minerals. Nice and simple, but also not including choline or DHA for brain and eye development. Interested? 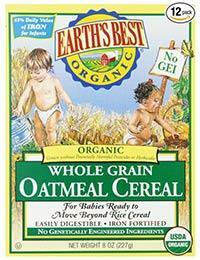 Check out the Earth's Best Organic Baby Cereal here. 3. Happy Baby Organic Baby Cereal. 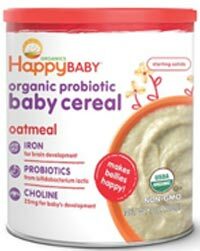 If you've been looking for the Happy Bellies Oatmeal, this is it, just rebranded as Happy Baby Organic Baby Cereal. This is an oatmeal blended with a nice variety of vitamins, probiotics, choline, and DHA. The vitamins are similar to what appears in all of the other cereals on our list, including vitamins A, B6, B12, C, D, and E, along with a good amount of iron, calcium, folate, and riboflavin. Regarding choline, it is an essential nutrient that's usually provided as lecithin or bitartrate, occurring in high amounts in foods such as beef liver, cauliflower, wheat germ, and soybeans. This cereal also contains 4 probiotic strains, along with a single prebiotic that also acts as a mild sweetener (fructooligosaccharides); together, these help maintain the gut flora, this the old "Happy Belly" name of this oatmeal! Like the others, this is certified organic, and contains no artificial ingredients or sweeteners. A bonus is that the packaging is made without BPA, the company partners with great organizations like Autism Speaks, Allergy Kids Foundation, and Feeding America. And by the way, you're supporting a mom-owned small business that was founded in 2006 and brought one of the first gluten-free baby food products to the market! So not only does the food taste great, consuming it will also make you feel good (well, in your tummy, and also for contributing to a company with strong values). Interested? Check out the Happy Baby Organic Baby Cereal here. Our #4 choice is the newcomer Bio-Kinetics Sprouted Cereal lineup. Fruit and Veggie Purees are the next step after your baby has graduated from baby cereal, usually around 6 to 8 months of age. Experimenting with fruit and veggie purees can be a real adventure! Don't be surprised if your baby spits out everything the first time, or even the second and third time you try it! Sometimes it can take 5-10 times for your baby to get used to a new flavor or texture, and this process is a really great developmental learning experience for your baby. So, don't give up on them! Our advice is to start by slowly mixing some relatively bland fruit and veggie purees into the baby cereal. Maybe some banana puree mixed into the baby cereal and breast milk (or formula), or some prune puree mixed in to keep things going in the diaper region when the cereal starts to stop things up! Here are the Best Baby Purees of 2019! Once you move on from breastfeeding or infant formulas and conquer infant cereal eating, you'll be ready to try out some baby food purees! To find the best baby foods of 2019, we purchased 8 different brands of fruit and vegetable purees, with 4 varieties per brand, and put them to the test! We tasted some of them ourselves and were surprised at just how good some of them were (really! ), and we had 4 different babies ranging in age from 7 to 11 months test them out for us as well. Judging by their facial expressions, fits of rage, and sometimes requests for more, we narrowed it down to just a small handful of varieties that we thought tasted the best and were most accepted by the babies. One of the most important criteria that we realized is when the fruit or vegetable puree tasted more like the real thing to the adults, the babies also tended to like it more. When it was too tart they tended to shy away, as they did also when it had some unidentifiable flavors (don't worry, those aren't on our list!). We also restricted our search to eating organically, so you don't need to worry about herbicide or pesticide residues, or any ingredients that are questionable. We care a lot about our little ones and want to make sure that at least the first year of life is kept as safe as possible by eating real food made with carefully selected and sourced ingredients. If you're interested in making your own baby food purees, check out our reviews of the best baby food makers. Note that unlike infant cereal, baby foods typically are labeled with stages. Stage 1 is where you'll start immediately after baby cereal (usually from 6 to 7 months), with only a single ingredient (like peas, sweet potatoes, prunes, or bananas). Stage 2 is where you start to introduce some new textures and two or more ingredients (like apples and cinnamon, or strawberry banana), usually from about 7 to 9 months old. Finally, stage 3 is when you get multiple combined ingredients and also some soft chunks of fruits or vegetables, usually around 9 to 11 months old. The organic stage continuum is the same as the regular one, so no worries there. 1. Plum Organics Baby Food. This certified organic line of baby foods is making a splash, with delicious flavor options, smooth textures, and responsible & sustainable ingredient sourcing and manufacturing processes. We got our hands on two of their most popular flavors: Pear, Purple Carrot, & Blueberry, and the delicious Banana Pumpkin. Both baby food flavors were excellent, so we went back for more and tried out the Apple & Carrot, and Pear & Mango flavors. We were not disappointed! They all tasted very fresh and high quality, and our baby testers all loved them, especially the Banana Pumpkin and the Apple & Carrot options! The Plum Organics baby foods are certified organic, non-GMO, and they use whole and simple organic fruit and vegetable ingredients as much as possible. There are no added salts or sugars, and there are of course no harmful preservatives, additives, or artificial colors or flavors. And the packaging is non-BPA and uses a child-proof and recyclable cap. Though we only are writing here about the Stage 2 blend varieties, Plum Organics also makes an excellent line of first foods, such as the Stage 1 JUST Veggies and JUST Fruits, which are highly recommended for babies just starting to try pureed foods. One of the concerns moms have asked us in the past is: without any artificial preservatives, how does the food stay fresh!? You will notice that all of our organic baby food options contain lemon juice, vitamin C, and/or citric acid, these ingredients add nutrition and taste while also serving as a mild preservative to prevent spoiling. These Stage 2 Plum Organics baby foods come in 4-ounce pouches. A large variety pack of 12 pouches with varieties of flavors usually comes in at around $13, which means they are just about $1.10 each. Our top baby food of the year, this is highly recommended! Interested? 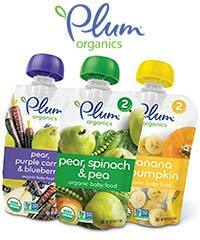 Check out the Plum Organics Baby Food here. 2. Sprout Organic Baby Food. This is another line of delicious certified organic baby food, also coming in pouches that do not need to refrigerated, just like the Plum Organics option above. Sprout uses only whole food ingredients, which means that there are no food-based derivatives or concentrated ingredients. They are also certified organic by QAI, and use no preservatives. The pouches are also BPA-free and the twist-off plastic cap is recyclable (the pouch is not). We got our hands on 10 different flavors, ranging from Stage 1 to Toddler (12+ months), and we were pleasantly surprised by how delicious and smooth these baby purees were. Our tester babies and toddlers kept coming back for certain favorites: the Stage 1 Sweet Potatoes, the Toddler Stage Banana, Buckwheat, and Blackberry (which was really delicious! ), and the Stage 3 Pumpkin, Apple, Red Lentil, and Cinnamon. We were really impressed by how fresh and high quality these baby food purees tasted, which in most cases were better than the fresh ones we make at home! One of the things we also loved about this baby food option is that the pouches do not need to be refrigerated, but also don't contain the usual preservatives that others contain, such as lemon juice, vitamin C, and/or citric acid. Just the whole ingredients, nothing added. And most of the ones we tested had expiration dates at least 6-10 months out. Once opened, however, you need to keep the pouch refrigerated and eat within 24 hours, since there are no preservatives in there to keep things fresh after being opened. Like all pouches, never try to heat or microwave; first, empty the pouch into a microwave-safe bowl and then go for it. Overall, these are truly excellent and definitely one of this year's best options! The only downfall relative to other options is that they are a bit more expensive than the Plum Organics, coming in at just over $1.25 per pouch. We also want to point out that Sprout has an awesome and diverse line of baby snacks, such as the delicious Curlz, Quinoa Puffs, and Crispy Chews. Interested? Check out the Sprout Organic Baby Food here. 3. 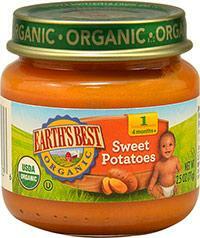 Earths Best Stages 1-3 Organic Baby Food. Earth's Best has put together an awesome lineup of organic baby foods spanning stages 1, 2, and 3. They have a vast range of fruits and vegetables to suit even a very picky baby, with Stage 1 options like sweet potatoes, peas, carrots, apples, bananas, and prunes. Stage 2 options are even more diverse, including even some exotic fruits and vegetables, fruit and veggie blends, and fruit and grain blends. Finally, at Stage 3 they introduce several new chunky blends of fruits, vegetables, and even some soups. Everything we tasted was quite good, and we were impressed by the consistent quality across the varieties. The older baby really loved the chunky vegetable beef pilaf, and even the adults thought it was a reasonable take on something they all thought would taste disgusting! These Earth's Best products are all organic, so that means no additives, no preservatives, and even no added salt or sugar. These are some of the best on the market and we have been consistently impressed with the quality and taste. Nothing fancy, and the containers and lids are recyclable, unlike most pouches. Highly recommended organic baby food from one of the few baby food brands that have been doing this for a while and doing it well! Interested? Check out the Earth's Best Baby Food here. 4. Happy Baby Organic Baby Food. This is just about tied with the Earth's Best for the best baby food of the year. The biggest difference we found between the Earth's Best and Happy Baby is that the Happy Baby comes in some more unique varieties that tend to appeal to some adults, like mangos as a Stage 1 fruit. They also tend to focus more on fruits than vegetables and come in a nice flexible pouch that more readily slips into a diaper bag than a fragile jar. But as a negative we found that some of the Happy Baby varieties were a bit more watery than the Earth's Best, especially the mangos and pears. In some cases, this made it more difficult to keep on the spoon and get into the baby's mouth. Our 3-year-old has taken to drinking the remaining mango pouches with a straw if that gives you some indication! Other than that, we believe the Happy Baby line of baby foods is a great addition to the market, and we highly recommend them for their quality ingredients, rigid manufacturing practices, and great flavors. Note that while some parents have expressed concern that the packaging might contain BPA, rest assured it does not: we contacted the company and they let us know that the packaging is 100% BPA free. It's one of the best on the market right now, so we suggest giving it a shot! Interested? 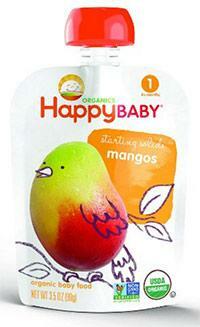 Check out the Happy Baby Organic Baby Food here. 5. Pure Spoon Organic Baby Foods. 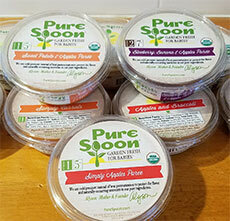 This was new to the market in 2018, and Pure Spoon is making quite a splash with their high quality, organic, whole-ingredient baby foods. We recently had the opportunity to test out the Stage One and Stage Two varieties of baby food. There's a lot to love here. First, Pure Spoon hand-makes every batch of food using only fresh (never frozen!) produce, using a cold-press process that maintains the nutrition, flavor, and texture inherent to the fruit and veggie. There are no added chemicals and the process doesn't use high heat, so the fruits and veggies also maintain their nutritional value. The result is a delicious, fresh, organic, and hand-made puree that is served in a cute 4.2-ounce container with a resealable lid. Second, all of the baby foods are 100% organic, as approved by the USDA and Nature's International Certification Services, and are made in an allergen-free certified organic kitchen. The Stage One varieties are called the "Simply Purees," which include only one ingredient, without any added preservatives, coloring, or flavoring. These are perfect for babies trying out first foods, and we absolutely loved several flavors, including the Simply Pears and Simply Apples. The Stage Two varieties were even tastier, including some of our all-time favorite baby foods, like Blueberry, Banana, and Apples, and the delicious Spinach, Pear, and Banana flavor. The Stage Two varieties are not as simple in their ingredients as the Stage One (usually including grape juice and lemon juice), and the textures and flavors are more complex. So, overall, we were really impressed with these baby foods and are excited to see what the future holds for this small company! Cons? Well, a 4.2-ounce container costs nearly $3 each, which is more than most other baby foods but also may be a bit more than you'd spend making it yourself (unless you're getting your produce at Whole Foods!). Of course, for the convenience and care that goes into these purees, we think it's worth the cost for the discerning buyer. Second, because these use a cold-pressure pasteurization process and do not use any preservatives, they must be refrigerated at all times. Part of the reason they're so expensive is because they need to be shipped in a cold insulated container. Which brings up my next point: be sure you'll be home soon after they are delivered! So overall, if you are looking for a delicious food that serves from a container that's like a little bowl (which is so much better than a can or pouch), this might be a good bet for you! Interested? Check out the Pure Spoon Baby Foods here. 6. Once Upon a Farm Baby Foods. This is a new addition for this year and we were lucky enough to get our hands on several varieties of flavors and textures. This is different from the others on this list, as it requires refrigeration to stay fresh. This is for a few reasons. First, Once Upon a Farm doesn't use any preservatives in their formulation, not even citric acid or any other natural additive. Second, while the others on this list use high heat to pasteurize their purees, Once Upon a Farm uses the Cold Pressure process. Cold Pressure has similar effectiveness for ensuring food safety, but also allows foods to sustain more nutrients and flavor. This is all excellent, but the downside is that the pouches are perishable and require refrigeration. The upside is that these very well might be the best-tasting, and freshest tasting baby food pouches on the market. And there are a ton of varieties to choose from, increasing in the complexity of ingredients and textures. They start simple and smooth for 5+ month babies, for example the Fairest of Pears and Magic Velvet Mango are delicious and simple. They then get a bit more complex in ingredients as you increase in age, for instance going up to 9 months to the Strawberry Patch option which has amazing taste, but also a more complex texture with the inclusion of small bits of shredded coconut and chia seed. Going even older, they make some truly delicious options for toddlers 18+ months, such as the amazing Chocolate Ever After, which is basically a dessert puree of banana, raspberries, and cacao. There is a lot to love about this company as well. Fruits and veggies are sourced from California and Washington state, ingredients are organic, kosher, gluten-free, vegan, and non-GMO. The puree pouches (the packaging) is also recyclable and BPA free. So a lot of great things here, and the flavor and quality to back it all up. Highly recommended, and we suspect this option will be climbing our list over the years! There are only a couple small drawbacks. First, the price is a bit high, coming in at around $2.50 per 3.5-ounce pouch. That's more expensive, on an ounce-by-ounce basis, than the Pure Spoon option above. Another drawback, similar to Pure Spoon, is that the pouches need to be refrigerated. We did transport pouches for a few hours in our testing (in 60 deg weather and without an ice pack) and then feed them, which seemed fine. Any longer than that, and you'll need to keep them in the fridge or bring along an ice pack in your bag. Interested? 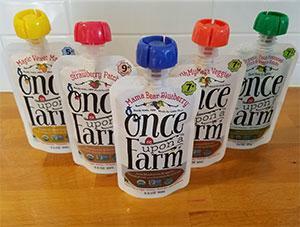 Check out the Once Upon a Farm Baby Foods here. 7. Amara Organic Baby Foods. This is a completely new addition to our list as of a few months ago, and we're really excited about this new option. These baby foods come as a dry powder, which is a great option for parents who want flexibility in selecting whether to add breast milk, formula, water, or any other liquid ingredient of their choice. It's a fantastic way of increasing acceptance of the food by adding a familiar ingredient, and also a great way to ensure baby is getting the nutrients you want at mealtime. To be honest, we were a little put off by the dry powder at first, but were surprised at how truly amazing it was! We tried 3 different varieties, including Oats & Berries, Tropical Mango, and Apple-Maqui Berry. Just like with baby cereal, you take a measured amount of the powder and mix in the liquid of your choice. The resulting texture is surprisingly similar to the traditional jarred baby foods, and the taste is truly excellent. We were really impressed by the fact that each variety only includes raw ingredients, without any fillers (like water) or additives (like lemon juice as a preservative). For instance, the Oats & Berries version only includes organic oats, apple, banana, and blueberries. Because it's a dry powder, no preservatives are required to maintain freshness; however, we are a bit concerned about the loss of nutritional attributes from the dehydration process. A great way to introduce first fruits and veggies, the varieties are available in stages starting at 6+ months, and going up to 8+ months, slowly introducing more complex flavors. Each pouch makes a good-sized bowl of baby food, though it does end up quite a bit more expensive than jarred baby food. The Amara pouches average about $2.50 per large serving, and the jars are usually around $1.00 per serving. But for a great-tasting, organic, non-GMO, baby food without additives or preservatives, and allowing you to mix with your preferred liquid... maybe worth the cost! Interested? 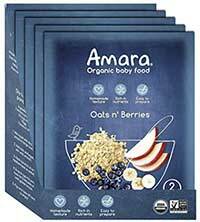 Check out the Amara Baby Foods here. 8. 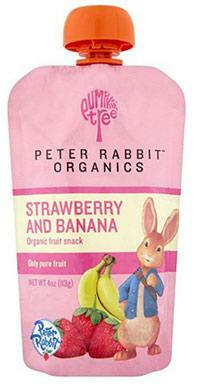 Peter Rabbit Organics Baby Foods. The Peter Rabbit line of baby foods is a newcomer to the baby food market and is making a huge splash! They feature some delicious varieties, like strawberry banana, and carrot, squash, and apple puree. The adults raved about how delicious they were, and the babies really enjoyed them as well. One of the babies couldn't get enough of the strawberry and banana puree! My personal favorite was the raspberry, banana, and blueberry organic puree, which I ended up putting in the freezer for 10 minutes to make it taste like a smoothie! Made in Oregon, these are certified organic by Oregon Tilth, and are never diluted and never contain any added salt or sugar. The packaging is also BPA free, which is comforting given the stories about some other squeeze packages. The only negative is that they do not have staged varieties, so these are best positioned as a Stage 2 option, after your baby has tried a few simpler single-ingredient purees. We didn't have any issues with watery purees, and thought the flavors were true to life. And you can't deny that the packaging is pretty darn cute, which counts for at least a few points! Overall, we believe this is a fantastic option for babies that are ready to move along to Stage 2 eating.